Are you ready to experience Refiuphoria? If you are, here are a few things you need to know about refinancing. It’s no secret that interest rates are still historically low. And as a homeowner, that could be great news for you, especially if you’re in a position to refinance. First things first, what is refinancing? Refinancing is simply the process of replacing an existing loan with a new loan. In this case, we’re talking about replacing your current mortgage. Now that we have the boring part out of the way, let’s move on to the more exciting stuff, like finding out what a refi could mean for you! A refi may lower your monthly payment. Cha-ching! By taking out a new mortgage, you may be able to get a lower interest rate. That means paying less monthly, and maybe even paying less over the life of your loan. If interest rates are lower than when you got your original mortgage, you may want to take advantage! If you’re in a better place financially, you can put that financial standing to good use. Maybe you have a better credit score, a higher income, or lower debt. All of these situations may mean better interest rates. Refinancing can also help you pay your loan off faster. For instance, you could switch from a 30-year mortgage to a 15-year. Sounds great, right? A 30-year mortgage may make the most sense when you’re a first-time homeowner. You’re new to the homeowning-game, and the monthly cost of a 15-year mortgage seems scary in comparison to the cost of a 30-year. As time goes on, you realize you could be putting more money towards the loan each month, and that might mean paying off your loan in a shorter period of time. Another refi option is to switch your loan from an Adjustable-Rate Mortgage (ARM) to a Fixed-Rate Mortgage (Fixed), or vice-versa. Why would you switch? 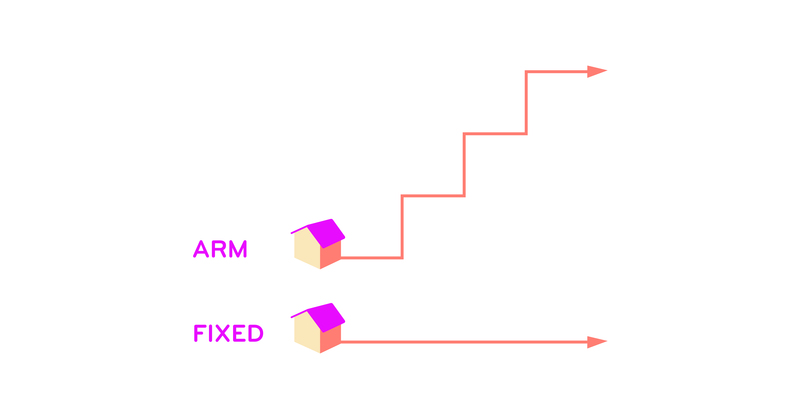 Well, ARMs can be great if you plan to move or downsize in the near future. They generally provide a lower interest rate at the beginning of your loan but may increase or decrease over time. If you’re thinking of moving soon, you may be able to sell your house before the initial rate period of an ARM ends. But, remember that life happens. You may not be able to sell as quickly as you planned. On the flipside, by switching to a Fixed-Rate Mortgage (interest rate remains the same through the life of the loan), you know exactly what you’ll pay in interest without having to worry about it changing. Keep in mind, if you have an Escrow account, your monthly mortgage bill may still adjust. Your Escrow account covers taxes and insurance, which change over time. Have you been wanting to update your kitchen, pay for college tuition, or consolidate debt? Refinancing might be the way to do it! One popular motive for refinancing is the ability to gain access to your home’s equity. Mortgage interest rates tend to be lower than most other loan rates, so refinancing might be a better option than swiping that plastic or taking out a personal loan. Refresher: When your home’s value is higher than the amount of your loan, you may have equity. The amount of equity is the difference in the value of the home and the amount owed. More on that later. We wouldn’t be painting a full picture if we didn’t mention that there are pros and cons to refinancing. Such benefits as lowering your payment or accessing equity for a renovation can definitely be rewarding, but make sure you consider everything before making a final decision. If you choose to refinance, you may have to pay some initial fees. These costs can vary widely and may include fees for the application, appraisal, inspection, and more. Ask your lender what fees may occur. Remember, refinancing means getting a new loan, and it may require a credit check (which can affect your credit score) and income verification. You may also need a home appraisal. There are a lot of refinancing options out there, and that can start to feel overwhelming. But, have no fear! Your lender can help you figure out what type of refi will be best for your situation. Refinancing may not be for everyone. Let’s say your finances are currently “up in the air” because you’re between or changing jobs. This may make it harder to qualify. Another example would be if you plan to move in the next few years. It generally takes about three years to recoup the expense of a refi. Again, work with your lender to see if refinancing is a good call for you. Ok, now the part that probably gives you the most angst. Do you qualify? Lenders tend to pay attention to three main factors when approving borrowers. What is a debt-to-income ratio? Exactly what it sounds like! It’s the percentage you get when you divide your debt by your income. Let’s say you make $5,000 per month, and your expenses equal out to $1,000 per month. Your debt-to-income ratio would be 20%, because 1,000 divided by 5,000 is .2. The lower your debt-to-income ratio is, the higher your chances are of being approved. Some lenders may look to see how much equity you have in your house. Remember, equity is the difference between how much your home is worth and how much you owe. Let’s say your home is currently worth $280,000, and your mortgage is $130,000. You have $150,000 (54%) in equity. You’ll have a better chance of being approved if you have a higher percentage of equity. What do your credit score and history look like? A high credit score shows lenders that you are a responsible borrower, making you a lower risk for a loan. The score is affected by a few factors, including credit history length, payment history, and types of credit. Generally, the higher your credit score, the lower your interest rates. If you’re planning to refinance, you should try to avoid changing jobs or careers, opening or closing credit cards, and making big purchases like furniture or a new car prior to applying. These actions may make your situation seem less steady to a lender. How do I choose a new loan? You’ve made it all the way to choosing a new loan. Congrats! This is usually the last stage of the decision process. By taking the time to compare, ask questions, and even negotiate, you will be able to find the loan and lender that most closely meet your needs. Yay! Take a look at reviews, products offered, and the company in general. Look into companies that you would be excited to do business with. Recommendations from friends and family can also go a long way. Once you’ve decided on a few potential contenders, reach out and discover what options may work for you. Narrow down your possibilities by reviewing types of loans, interest rates, and loan terms. Doing your homework could save you quite a bit of money. Once you’ve crossed all your t’s and dotted your i’s, you’re ready to answer the biggest question: “Should I refinance?”. Whether you’re looking to lower your monthly payment or switch from an ARM to a Fixed, you just may be ready for a refi. This article is provided by TMS’s Happy Hub for educational purposes only. It is not meant to constitute mortgage or financial advice, nor is it meant to constitute legal or tax advice. To make sure you are are making an informed decision, please consult one of our Loanologists (licensed mortgage loan originators) before proceeding with a refinance. By refinancing your existing loan, your total finance charge may be higher over the life of the loan.